Use the tabs to navigate the page – just as you would within the app! The Record tab is the first one that shows when opening the Computer menu. 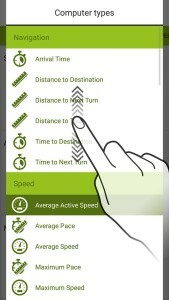 The function lets you track your efforts during a workout/trip. It will log your activity and store all related sensor data. Start recording by tapping the bottom right button. You can pause the process by tapping the same button again. 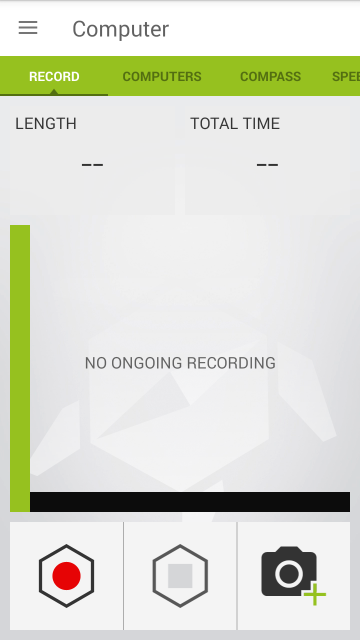 To stop the recording, tap the center button. Using the bottom right button, you can add your current location as a Favorite. 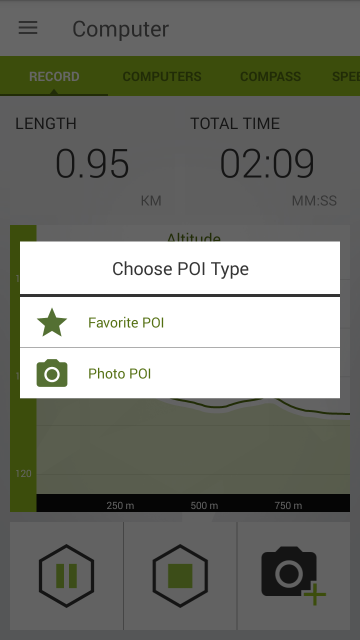 During an active recording, this button lets you add a Point of interest (POI), that is either a Favorite, or a Photo POI (regular POIs will be saved as favorites, Photo POIs will become part of the track you are recording – if you intend to share your POIs, add them as a Photo POIs and share the whole track). You can also edit/add pictures to a ride later after you finished recording. 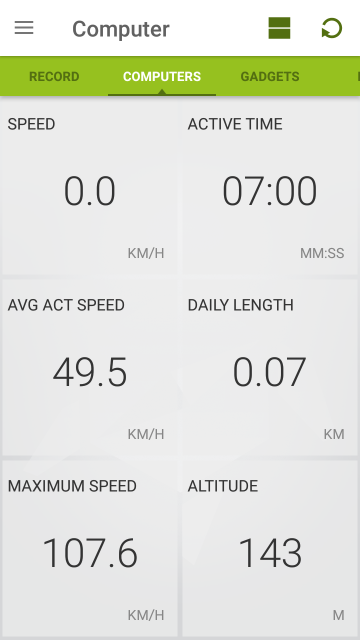 While recording, tap the altitude graph to display a speed graph instead (if heart rate data is available, the app can also display a HR graph). 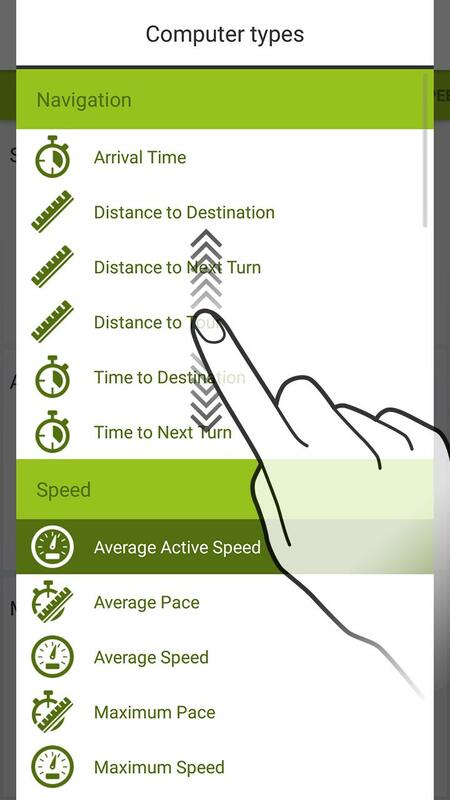 This feature is part of the Gadgets package and can be accessed by tapping the ‘Computer’ button in the Main menu. This screen will display all the data you have access to (depending on sensors). Using the two buttons at the top right of the screen you can modify the pane layout () and reset () all counters (minus the odometer) if needed. Tap and hold the computers to modify them. The panes at the bottom of each screen can be modified to display your preferred information. To do this, tap and hold the pane you would like to change and select the information you would like to see displayed. 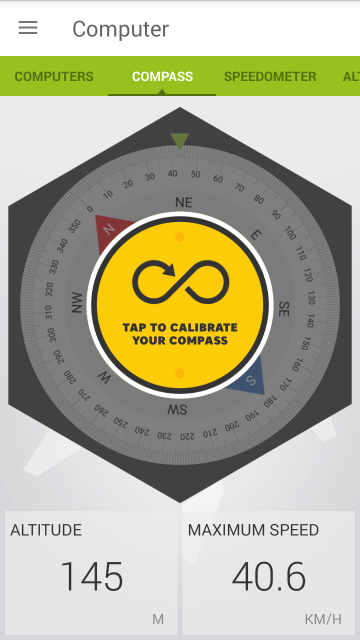 A handy compass that shows you the cardinal directions. 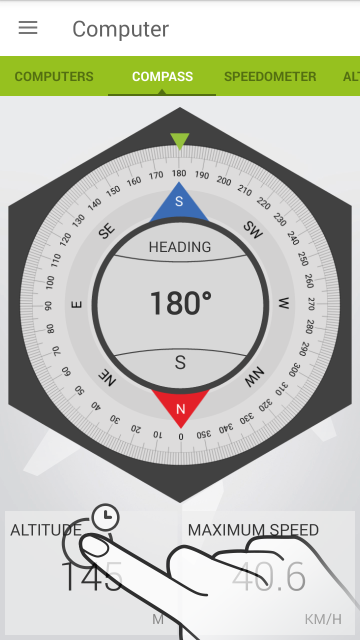 If you are navigating, you can see the remaining distance and your maximum speed at the bottom of the screen. These computers can be modified by tapping and holding them, then selecting the desired data to be displayed. The orange arrow shows the beeline direction to current destination (only when navigating). In case the device needs to be calibrated, follow the onscreen instructions. 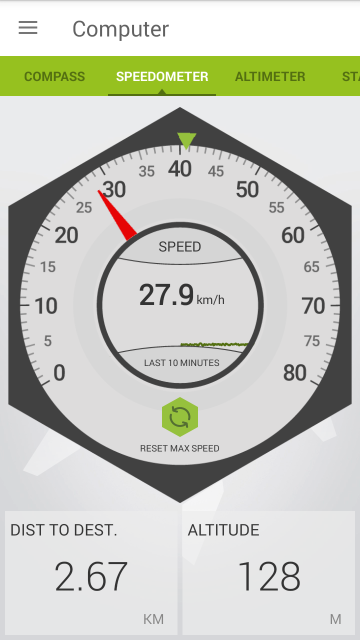 The speedometer visualizes your speed information on a nice analogue gauge. 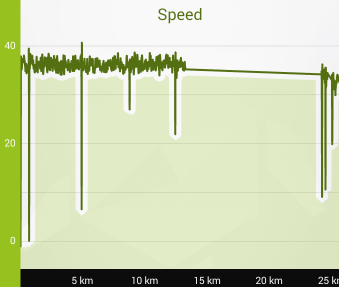 The graph in the center shows your average speed for the last 10 minutes. 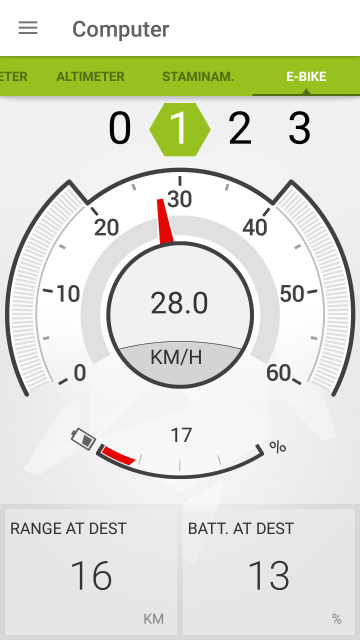 You can reset the maximum speed value by tapping the green button whitin the gauge. 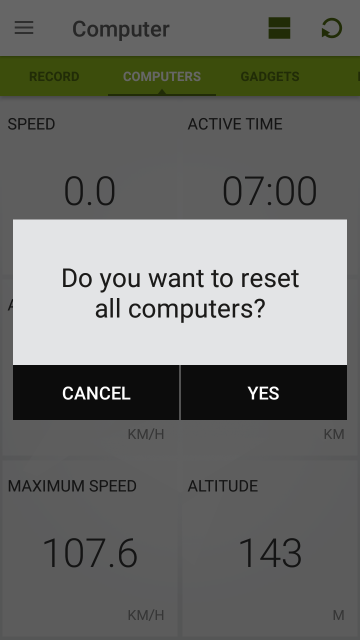 The bottom of each screen can be modified to display your preferred information. To do this, tap and hold the pane you would like to change and select the information you would like to see displayed. 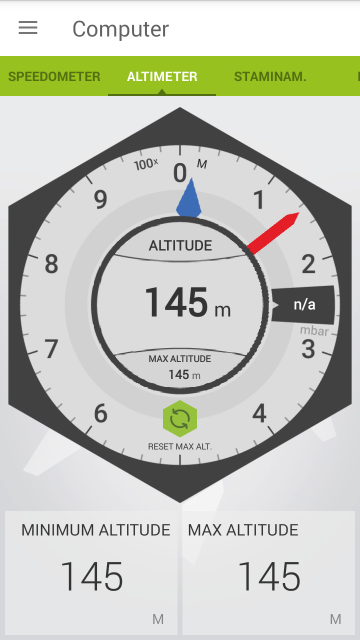 The altimeter shows your current altitude on an analogue gauge. 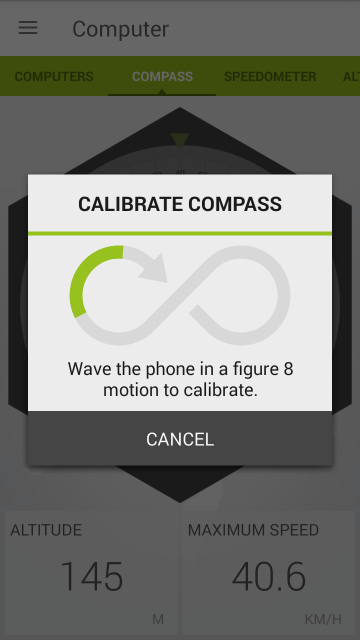 If your phone has a built-in barometer, the atmospheric pressure will be displayed on the right side of the gauge. The red and blue hands show 100/1000 m/ft increments respectively. 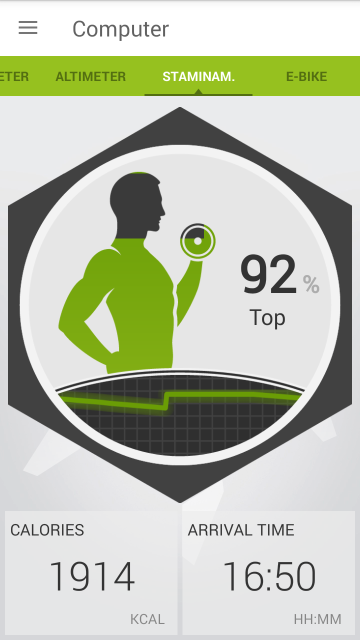 This feature lets you track your effort by showing you your relative stamina. The marker will decrease over time while you are riding and will increase again when you have a rest. 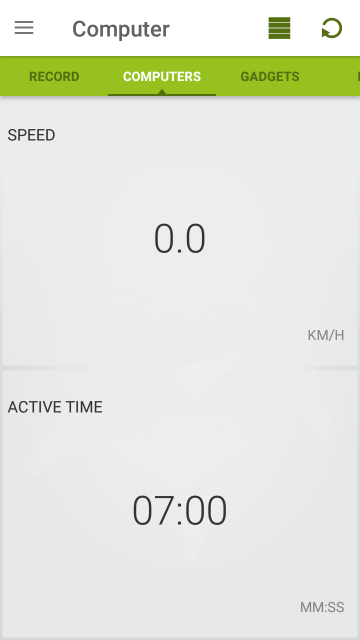 This feature is part of the E-Bike package and can be accessed by tapping the ‘Computer’ button in the Main menu. If you have a Fischer E-Bike, you can also redeem the E-Bike package for free – for further information, please follow this link. 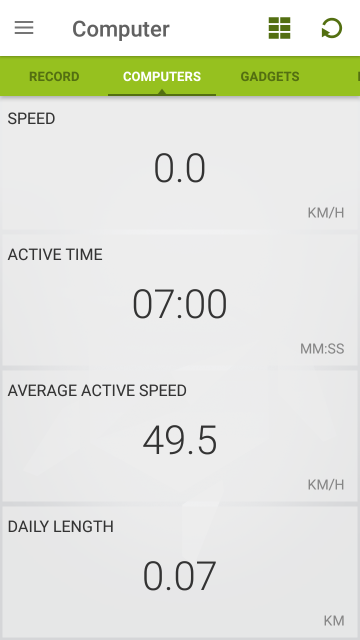 If you have an electric bicycle, this screen creates a complete dashboard where you can monitor all data related to the bike and its performance. You can track the battery state, the remaining power, the assist level the motor is helping you with and the current range of the bike. If you prefer to see the map while riding, the range will appear as a heat map, showing the bike’s limits according to the surrounding terrain.